SSRS report times out even though Report Server settings are set to "Do not timeout report"
1. SSRS report times out even though Report Server settings are set to "Do not timeout report"
​Over a year ago we tried changing our Report Server settings so that reports would run to completion instead of timing out after 10 minutes. Despite making those changes, reports would still timeout after 10 minutes. To get around that problem, I ended up changing the specific reports to run in "pre-process mode" by changing the data provider class to specify that it extends the SrsReportDataProviderPreProcess class. Due to monthend, today we have an urgent situation where a much-needed report is timing out, and we're unable to make the necessary pre-process changes without having to do a code release to our PRD environment. Currently I have the Report Server Site Settings and the report's Processing Options set to "Do not timeout report". The report still times out after 10 minutes. Any other quick suggestions for allowing this report to complete without timing out? 2. RE: SSRS report times out even though Report Server settings are set to "Do not timeout report"
usually, the first thing to check when SSRS reports start timing out with AX 2012, is the class that generates that specific report. Code changes can be performed to optimize report processing and prevent that 10 minute query timeout. However, it can happen that the report is already optimized and still runs over that 10 minute default limit because of data volume or other factors that could impact run time. That's when I usually go and specify a longer QueryServiceEndpoint sendTimeout value to allow reports to complete without error. In order to do so, just take an AXC file that contains information to connect to the desired environment and copy it to the report server's bin directory (usually C:\Program Files\Microsoft SQL Server\MSRS11.<INSTANCE>\Reporting Services\ReportServer\bin). Note that the MSRSXX can vary based your version of SSRS. 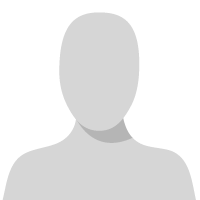 Make sure to rename the config file to exactly Microsoft.Dynamics.AX.ReportConfiguration.axc. Edit the file with a text editor and look for the QueryServiceEndpoint binding, then the sendTimeout property next to it. By default, it will be 00:10:00 (10 minutes) but you can change it to whatever value you find acceptable for a decent report run. Let me know if that solves your issue! Subject: SSRS report times out even though Report Server settings are set to "Do not timeout report"
3. 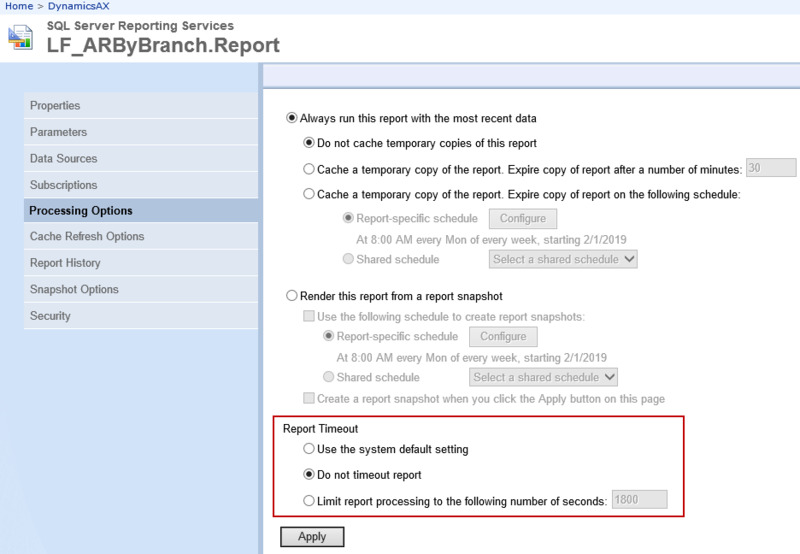 RE: SSRS report times out even though Report Server settings are set to "Do not timeout report"
Are you pulling this reports from a temp table? try changing it to regular table. 4. RE: SSRS report times out even though Report Server settings are set to "Do not timeout report"
There are 3 "bin" subfolders within the folder structure. Should I put the .AXC file in the bottom bin folder? 5. RE: SSRS report times out even though Report Server settings are set to "Do not timeout report"
@Rudy Salcedo, it looks like you don't have the SSRS subfolders on that server. The custom AXC file needs to reside in the \ReportServer\Bin folder of the SSRS instance used for your AX environment. 6. 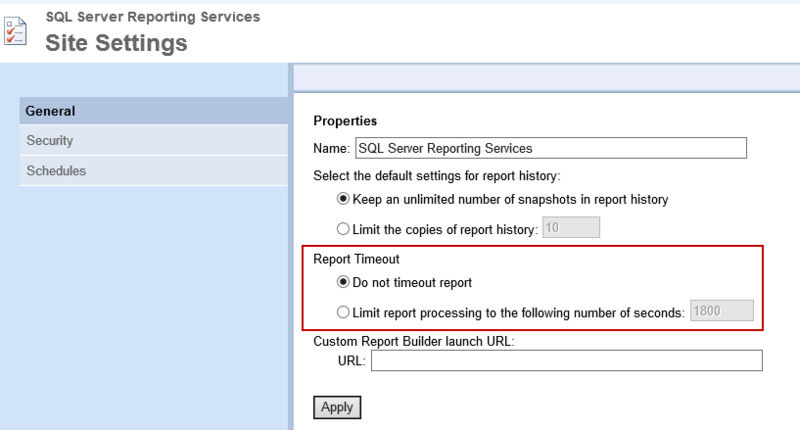 RE: SSRS report times out even though Report Server settings are set to "Do not timeout report"
7. RE: SSRS report times out even though Report Server settings are set to "Do not timeout report"
@Yvan Charbonneau - ​I followed your instructions to increase the sendTimeout parameter from 10 to 30 minutes in our PRD environment and the report no longer times out. I ran it about a dozen times and the runtimes ranged between 11 and 20+ minutes. Thanks for your help! 8. RE: SSRS report times out even though Report Server settings are set to "Do not timeout report"
@Rudy Salcedo that's great news! Glad to see you solved your issue.